Dad, a fish is looking at my hopper, he’s drifting along behind, he ate it! That was the beginning of a fly fishing journey that continues today. On that day my son, Zach, hooked and landed a sixteen-inch brown trout on a dry fly on the Pere Marquette River. My wife said I beat the anchor to river bottom to get that fish in the net. Zach was 9 years old that August day. Due to that today at twenty-seven he is a fly fishing addict. He can cast beautifully and row a boat. He and I have wonderful conversations about flies, techniques, destinations etc. We are now planning our fourth trip to Patagonia. How lucky can I be? To have your child consumed by the same passion as you is heaven on earth. Many anglers, including guides, will tell you that young children aren’t ready to tackle fly-fishing. This isn’t true! 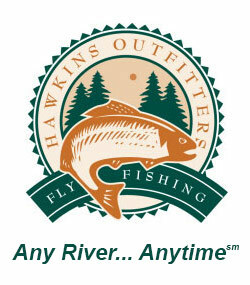 I can introduce you to lots of children, male and female, that fish with Hawkins Outfitters all the time. They are all under fourteen and most started at less that ten years old. Most states are reporting a drop in fishing license sales due to the urbanization of America. Seems like children aren’t getting instruction in the ways of the woods and the waters. I believe adults have a responsibility to both children and the resource. Finally, who will protect the waters tomorrow if we don’t create anglers today? Teaching a kid to fly cast is easier than teaching an adult. Due to the fact they haven’t spent years learning to flick their wrist to cast a lure with a spinning rod. At Hawkins Outfitters we use Joan Wulff’s method to teach children. Have the angler hold the rod with two hands with their thumbs on top of the rod. Teach the child to make a cast by lifting the rod, and accelerating it to an abrupt stop. Have them stop the rod near their ear and wait for the line to straighten out behind them. A smooth accelerating stroke forward, followed by an abrupt stop with the tip at eye level. As a result they will form a nice loop and deliver the fly. 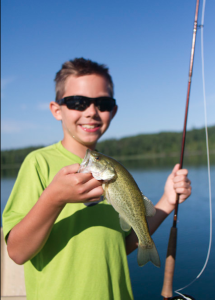 We generally start a child on a pond or lake fishing for bluegills and bass. Therefore they don’t have to deal with moving water and dead drifts. Just deliver the fly maybe move it a little and set the hook. 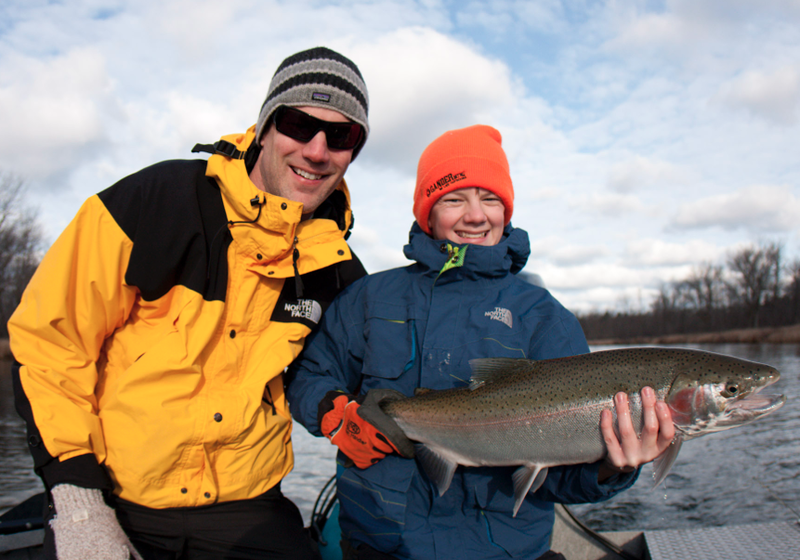 With hookups you can teach the child how to use the reel and rod and fight the fish. They Need to Catch Fish! This brings me to the second and maybe the most important part; they need to catch fish. The fish can be any kind. Consequently in the beginning I think dumber is better. There is enough time in the future to learn the refinements of matching a hatch or delivering a streamer one-inch from cover. Since your goal is to create an angler, get them hooked up. We have taken big numbers of kids to the Garden River in Sault St Marie, Canada. Because it is such fantastic fishing kids love it. This is the kind of place where anglers sight fish all day long. There is lots of action, a necessary ingredient for children. As a result we have created a number of new anglers. Look for fishing venues like this in your area. Don’t put your expectations on a kid. Let them have fun. Find joy in little successes. Ten Bluegills on a dry fly will excite most kids. You’ll be surprised how fast they’ll want to learn trout fishing. Make a big deal out of firsts. The little accomplishments along the way should be noted and celebrated. The picture of the first fly caught fish should be proudly displayed. Realize that most kids don’t have the staying power to concentrate on fishing all day. Let them drive the boat, teach them how to skip rocks, do what they want and they’ll want to come back again. Show them your enthusiasm for fishing and your respect for the fish. Explain why they are in certain spots, what they eat, who eats them etc. Give them as much info as they are interested in. If they aren’t interested in what you are talking about discuss something they are focused on. Children are like sponges, they soak up everything. With a little time and effort you can put them in a position to soak up fly fishing, a wonderful life long sport. In the process I hope you hear those exciting words “Dad I got him”. As a result you’ll have a fishing buddy for life.